Mark your calendars, buy your tickets, submit your applications! We’re ramping up to the Pivot East pitching competition, where the best startups in East Africa come to show what they have, pitch their startup to investors, media and the judges for a chance to win the prize money. 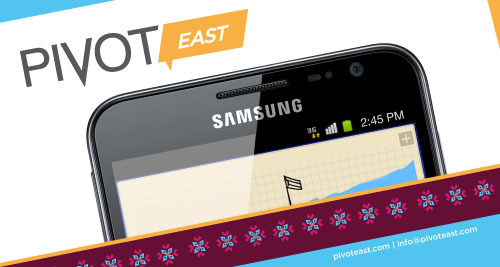 Pivot East will be held at Ole Sereni Hotel in Nairobi, June 5th and 6th. Last year we had over 100 applications for the 25 slots, and we’re expecting even more after seeing how well Pivot25 did last year (writeups by TIME Magazine and CNN). Last year we saw startups from Kenya, Uganda, Rwanda and Tanzania, and this year we’re hoping to see some from South Sudan and Somalia as well. As last year there are five categories, each of which will have five startups that will pitching in them. If you think you have a prototype, a deck and a business plan to wow everyone with, let’s see it. Applications are open. 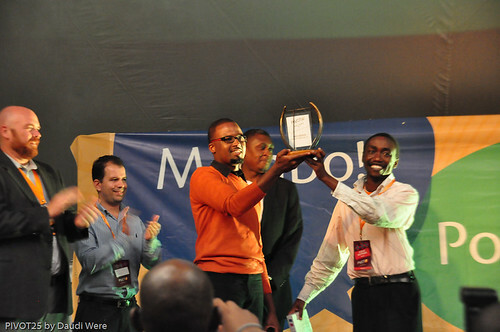 Pivot East is put on by the m:lab East Africa, an incubator for startups in the mobile apps and services space. All profits go to support the facility. This year support comes from Samsung, and we’ll be announcing a few more big names in the coming weeks. If you’d like to be one of them, contact us. If you have any questions, we’re having a meeting a Baraza at the iHub on Monday the 6th of February from 2.30pm to 3.30pm. If you’re a startup wanting to know more, or are media or an investor, come by and talk to the organizing team. Somalia is intriguing. Since they 7th century they’ve been refining and working within their Xeer system of community law and have a violent aversion to the authority of any centralized government. It’s also one of the most entrepreneurial, hard-edged business cultures around. For instance, there are currently 7 mobile operators, offering better and more varied services (at lower prices) than almost any other country in the region. Why I’m interested in Somalia is two-fold. First, I’m interested in watching how the international community tries to force central government on a society that clearly abhors it and functions without it. Second, Somalia is a fascinating study for anyone watching the African tech and business scene. Out of one of Africa’s harshest environments, entrepreneur’s thrive. Somali’s have been using the Hawala form of money transfer for centuries, to the tune of approximately $1.6 billion annually. Somalia, per capita, has one of the largest diaspora populations in the world. One in eight Somali’s live abroad. Therefore, it’s not surprising that the remittances they send make up approximately 40% of urban household income, averaging out at $132/per. While the political ramifications of Hawala are hugely important and interesting in the post-9/11 world, what I find more pertinent are the mechanics and how technology is changing the way it works. 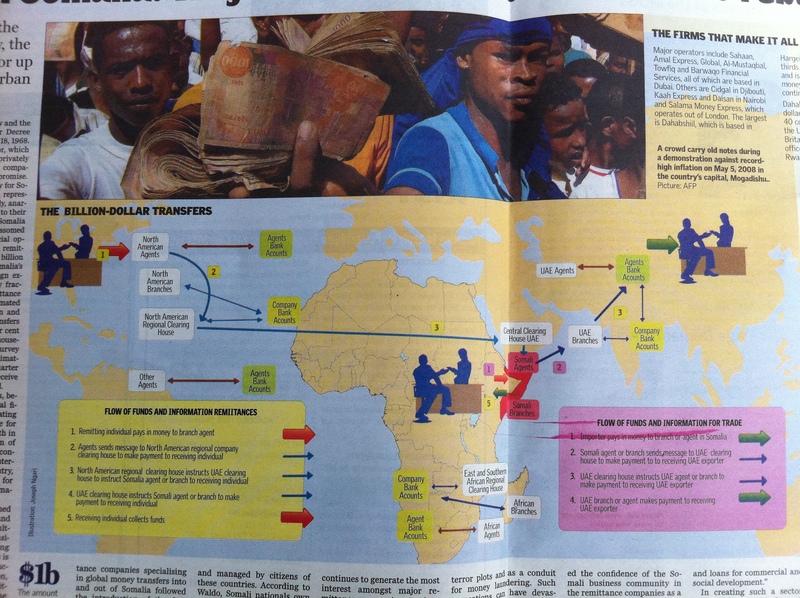 The East African newspaper put out a good visualization today on the way that Hawala currently operates in the form of remittances from Western nations to the Middle East and finally to Somalia. The United Arab Emirates (UAE) serves as a central clearing house for both simple cash transfers and more complicated import/export relationships. 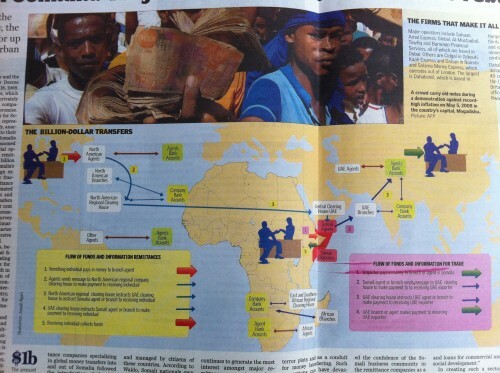 As can be seen, the person in the US or Europe gives money to a branch agent in their country. This is sent to a central country clearing house, then onto a UAE clearing house, then to a Somali agent and finally to the individual who collects the funds in Somalia. It used to be that Somali local private operators could only communicate by HF radio (yes, they did it before this via trust networks, family ties and paper), but when the mobile phone revolution hit Africa in the 90’s the communications were made more efficient. At first this was through satellite phones, and now by the robust local mobile phone network. There are no commercial banks in Somalia. The country’s relationship with international creditors has been frozen for over 20 years and has a national debt of $3.3 billion, of which 81% of that is in arrears. It’s safe to say that no one is going to lend money to Somalia anytime soon. The most attractive economic growth would seem to stem from Hawala organizations opening up arms that do commercial, formal banking. Wealth generation without the ability to access debt and credit is more difficult than if you have those tools available – for businesses and for individuals. I just got back from Mombasa, and there are large amounts of money being imported into Kenya and invested, both at the coast and in Nairobi. Somali’s have clearly shown their enterprise ability and entrepreneurial spirit, there are great swaths of the city that are almost 100% Somali owned now. However, until the communities there figure out a way for life and business growth to be more tenable, the investments will continue to flow to Somalia’s more secure neighboring countries rather than building their own. 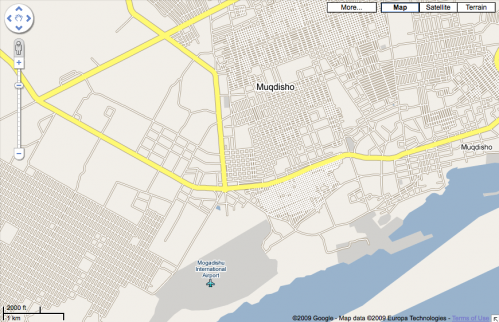 The Map-the-World and Map-Maker teams at Google have been making some major, and much needed, additions for Africa. 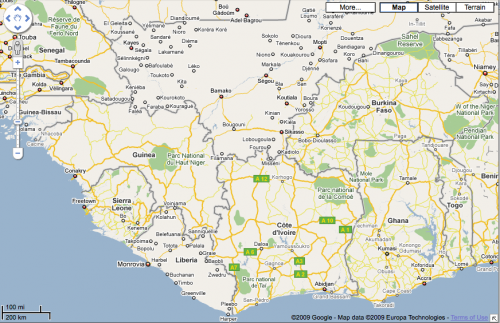 With a large data push yesterday, Google Maps has one of the most impressive sets of maps on Africa that you can find. Benin, Botswana, Burkina Faso, Burundi, Cameroon, Cape Verde, Central African Republic, Chad, Democratic Republic of the Congo, Djibouti, Eritrea, Ethiopia, Gabon, Guinea, Gambia, Ghana, Ivory Coast, Madagascar, Malawi, Mauritania, Mozambique, Niger, Nigeria, Reunion, Sierra Leone, Somalia, and Togo. What I wanted to do was compare old map tiles with new ones, but I didn’t have any screenshots to do that with. Instead I did a quick comparison of a few countries – those that were just announced vs ones that weren’t on the list. A good example of this is found when comparing Mali to Burkina Faso in West Africa. 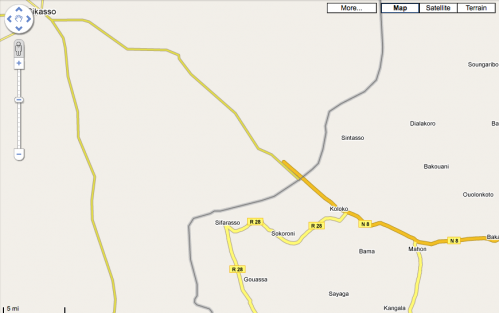 There are significantly more town names in Burkina Faso, and all the roads either have names or numbers. In Mali, which hasn’t been done yet, there are some major roads outlined, few towns are named, and no minor roads to speak of. Also of interest, you’ll notice how the roads that should intersect at the borders, do not. Here’s another interesting view of West Africa. You can clearly see that there has been a lot of data added for all of these countries, except for Liberia and Mali. 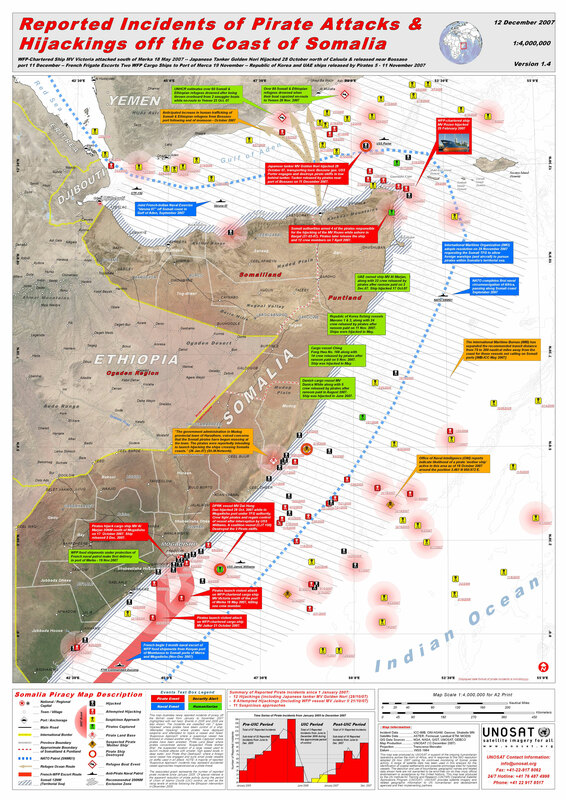 UNOSAT has released the following map of pirate activity off the coast of Somalia in 2007. Fascinating map. You can download the much larger and more detailed 6Mb PDF of the map here, or you can click on the image above to see a larger jpg of it.